It was time for another climbing holiday. I voted for yet more Californian granite, but the significant other just rolled her eyes and announced we weren’t going to the USA while Trump was in power. 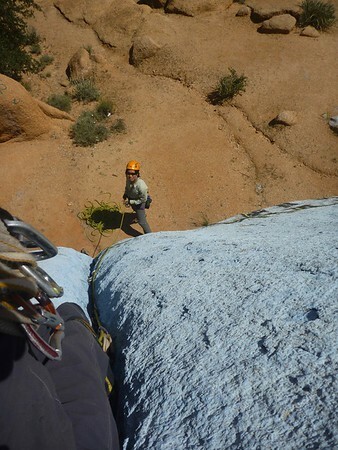 A google for good trad climbing in a sunny location not in USA suggested there was good stuff in southern Morocco. 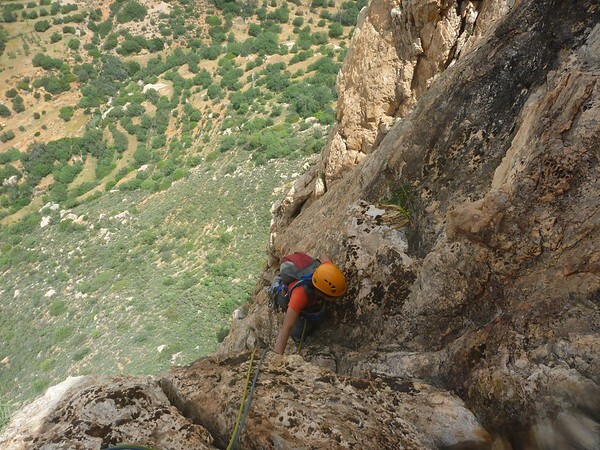 I’d heard of Todra Gorge, with its razor sharp limestone and euro-sport circus. But the Anti-Atlas mountains? 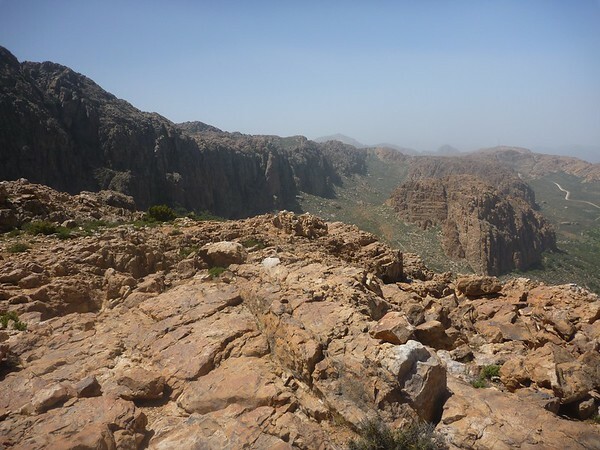 Jebel-el-Kest, the Ameln Valley, Tizgut Gorge and Tafraout? Never heard of such things. We arrived in Casablanca bleary-eyed and seriously jet-lagged. First task was to check out the local patisseries (excellent - tick!) then catch the train to Marrakech. Despite several attempts by a taxi driver to kill us, we arrived in one piece and exhausted at our hotel in the old town. I collapsed into a bed that’s too short, falling asleep to the sounds of a distant drum rhythm and a snake charmer’s flute from the nearby night market. The next day we rented a car, and it was my turn to out-do the previous night’s taxi ride and dodge motorcyclists, donkeys, carts, errant pedestrians, speeding buses and lumbering trucks as we sought the main road south. 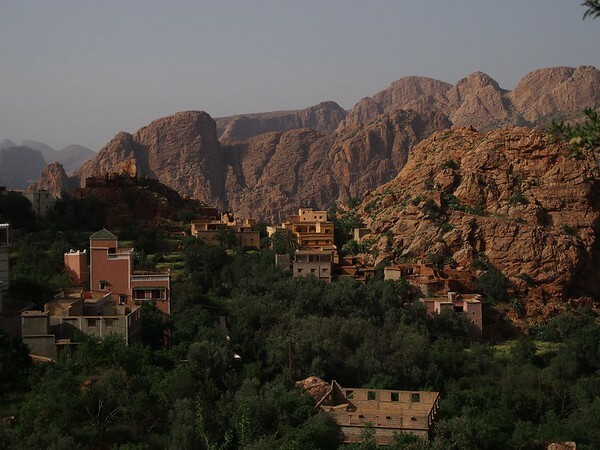 Inshallah - god willing - we arrived as the sun was setting over a barren landscape of granite boulders nestling the sleepy village of Tafraout. 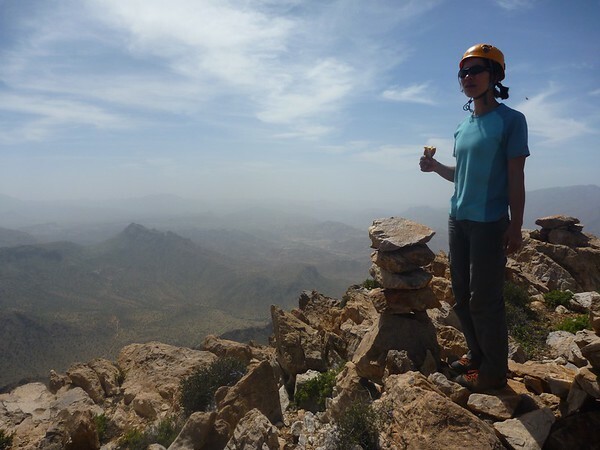 We settled for a roof-top apartment, dumped our gear and headed out to explore the town and grab a tajine. 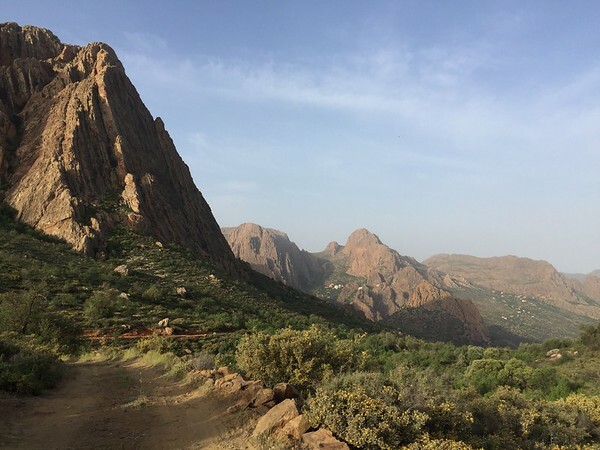 Although the village of Tafraout is surrounded by granite boulders (whose appearance reminded me of Joshua Tree), the surrounding mountains are quartzite - a yellow-golden pleasure-rock that offers solid jugs and fearless friction. 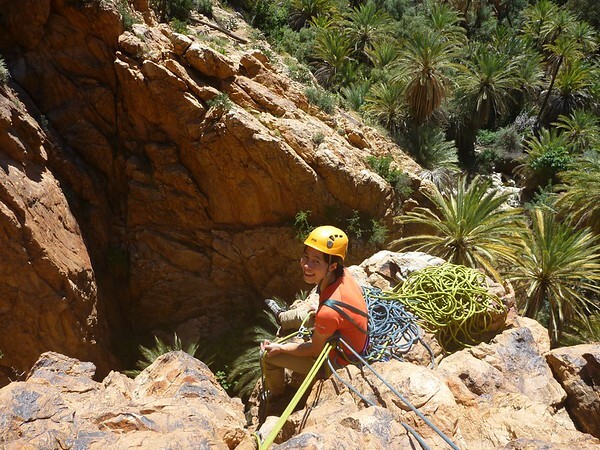 This palm-lined creek crag is accessed by a short walk through the small village of Oumsnat. The walk in was a delight, as we tip-toed through the ruins of the old village. I thought it was deserted and took plenty of photos and wandered around at will - sticking my nose into doorways - only to realise that although some of the buildings are ruins, other houses are still maintained and people are living in them! Half way up some VS that seems waaaay harder than the last VS we'd bumbled up, I wedge myself into a chimney position and contemplate life, the universe and dodgy gear placements, and some goats appear below, baaaaing and maaaaing their way up the gorge. Soon a happy Berber goat herder arrived. He threw stones and sticks to keep his goats together, then noticed our stashed bags and looked up, grinning. The shepherd mimicked climbing movements and had a good laugh. Wishing us well, he chased after his goats, busting a V3 move in gumboots to get past a boulder constriction so he could push a recalcitrant goat back down to the path! Boy-oh-boy, the rock is here is goooooood. Mostly scrambling but with a nice starting pitch and a fantastic summit boulder finale, this fun half-day scramble follows the ridgeline towards the “Bunny Ears”, a funky twin-peak summit. A great place to get your mountain skills in order so you can move quickly over less technical terrain, in preparation for bigger things. On route to the "bunny ears". Olympia - A crag with a distinctive summit boulder (Zeus). Some bloody excellent routes with perfect holds, glorious moves and buckets of exposure. Enmoore climbing some random 3-star route on Olympia crag. One must walk carefully in these parts. All plants and bushes are spiky or toxic, and probably both! Mickey mouse plant a.k.a. 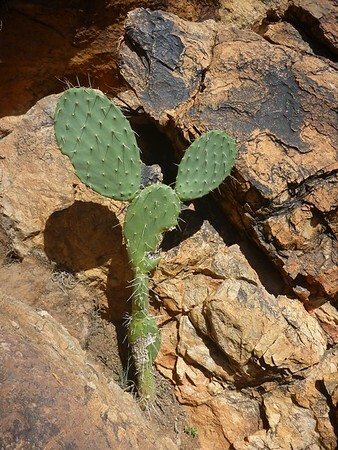 prickly pear. 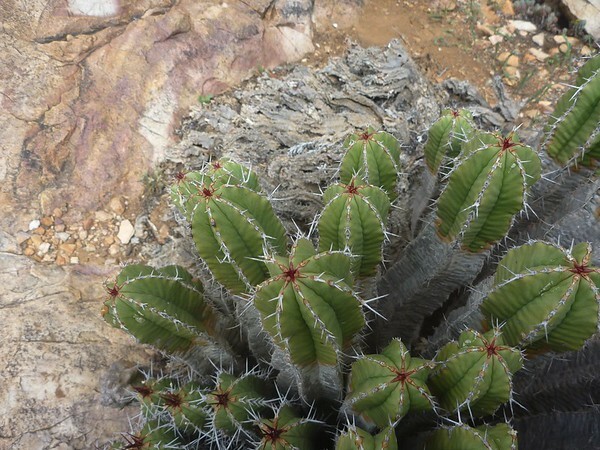 Some other prickly cactusy thing you don't want to trip and land in. The rock here 'tis good. 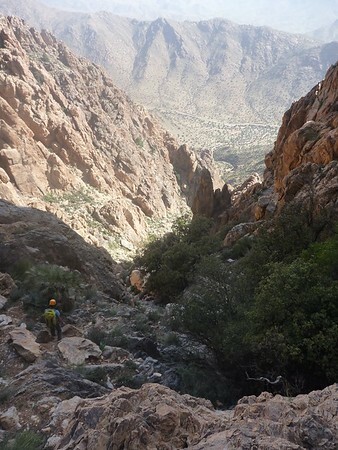 Tizgut Gorge is a deep ravine that slices through the mountain range. Some long multi-pitches, with a distinctive alpine flavour due to the fractured rock and complicated descents. Apparently Joe Brown climbed here back in the dark ages, so the whole area is sacred ground to Pommie climbers. We did a few routes here which were fun. A stiff 1.5 hour walk-in (isn’t as bad as it sounds) leads to a fab four-pitch journey up a distinctive pillar and wall. The first pitch offers good bridging, but then the chimney gets all awkward and you need to step out onto the face with less-than-perfect gear but more-than-perfect holds. Some thrilling exposed moves and you’re back in the line. 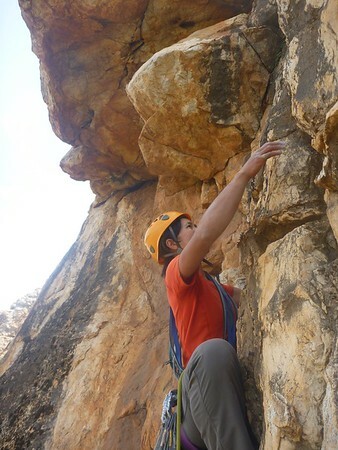 The second crux takes a wide step joining two crack systems, with great route finding. Things ease off then finish on a perfect summit. 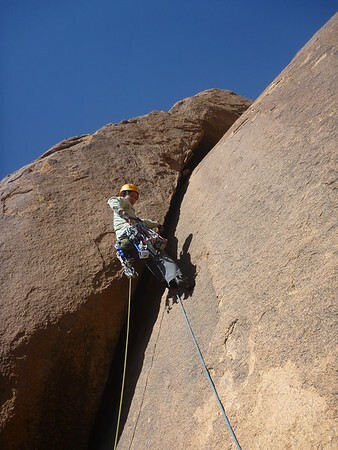 Enmoore leading the second crux. You know you're starting early when you beat the dawn call-to-prayer. 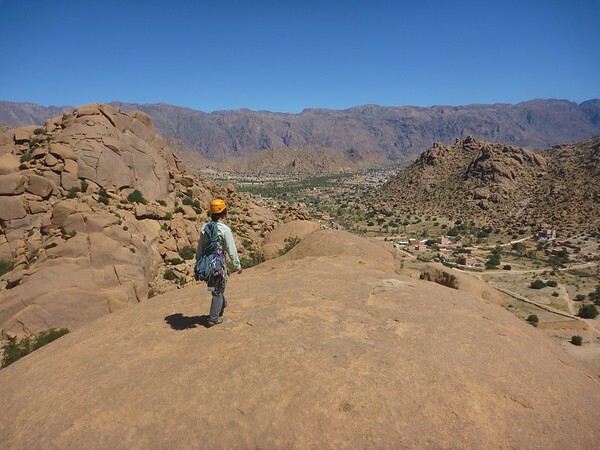 Lots of route finding and moving over easy terrain, plus some exciting ridge traversing and a “slightly traumatic move” stepping across from a finger of rock to the main face. We summited around 3pm but took another three hours to find our way down. 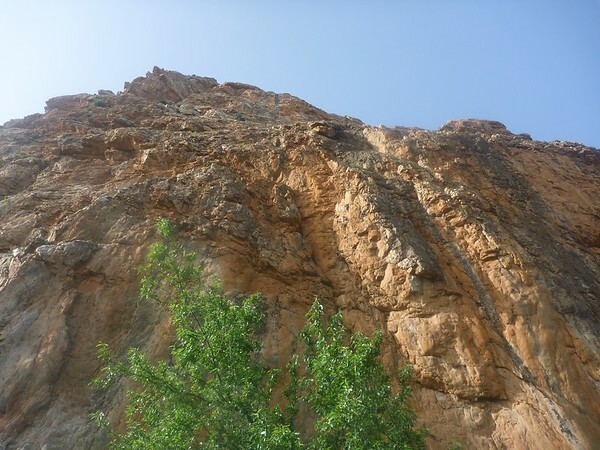 There’s an ancient Berber path that you descend, although at one point you need to gingerly lower yourself down onto a bus-sized chockstone and tip-toe across a gaping chasm. We naturally roped up for this. The Berbers obviously did this unroped in centuries past... much respect! Probably off route, somewhere on the Pinnacle Ridge. Rest day fun amongst the local town granite. Freeway is a long ankle-stretching slab that reaches a nice summit overlooking town, and Flake Quake is a series of wide cracks that are lay backed owing to the slabby angle. 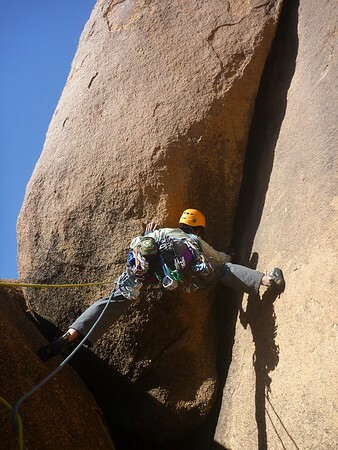 Apparently there are some harder steeper face routes on the granite around here, but we didn’t check them out. Walking back to town after a rest day on granite. The only bolts you’ll find in the Anti-Atlas are on the granite, as the quartzite is bolt-free. The last Frenchy who turned up and started bolting a mountain route was run out of town by the local villagers with the help of the constabulary! But don’t despair, the quartzite protects well and the current guidebook point out what’s bold and what’s goodly (in case you’re a bumbling aussie who can’t get their head around the wacky British grading system to figure it out themselves). 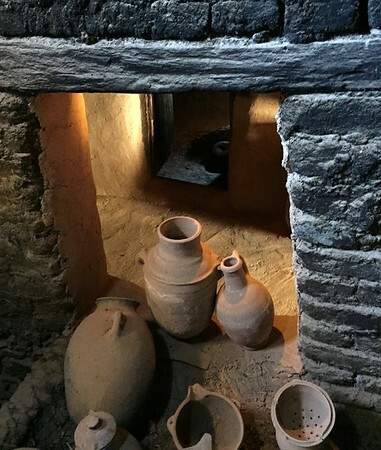 Cool pots and stuff in a traditional Berber house we visited. 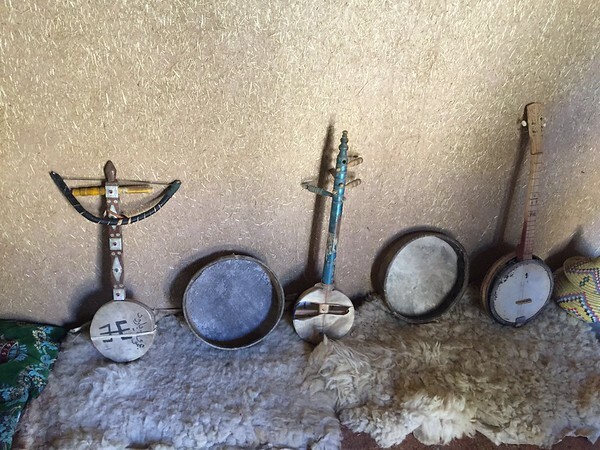 Musical instruments and adobe walls. 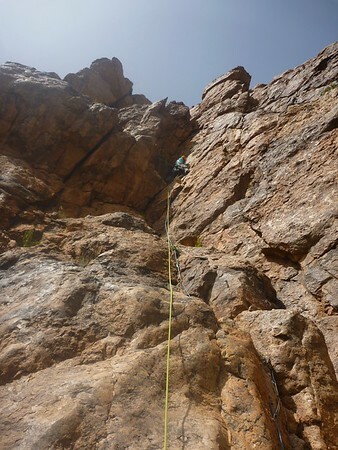 After a few weeks of the delights of Tafraout and Ameln Valley, warmer weather was due and we moved to the north side of the Jebel el Kest mountains, seeking shady north-facing crags. 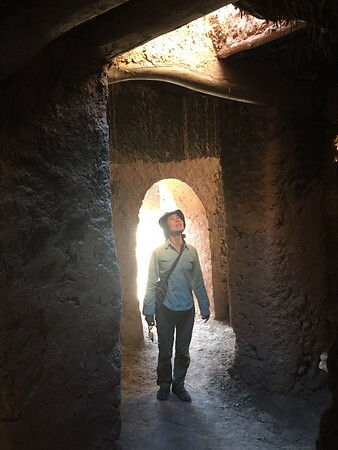 There isn’t much accomodation around here, so we headed to Kasbah Tizourgane, a fairly schmancy dig inside a restored casbah (fortified village) from the middle ages. We ran into some Brit climbers staying here (only the second climbing team we’d met since we’d arrived) and learnt they’d been coming back here for the last few decades. Endless new routes to do apparently!! Wandering the streets of the Kasbah. Later we found some simpler accomodation in the village of Madao down the road, which allowed us to stay in the region for a couple of weeks. 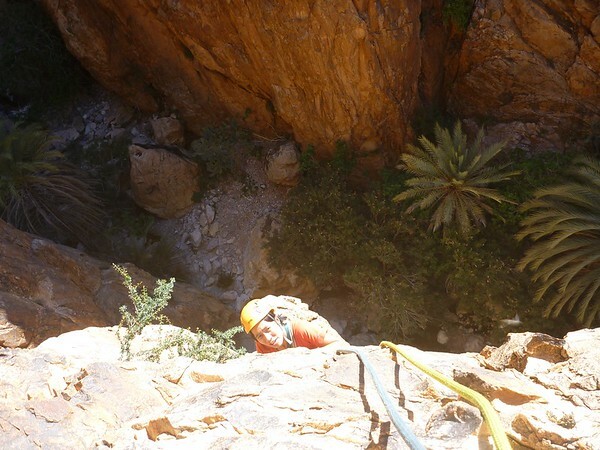 Beautiful slabby routes in the E1 - E2 range. Top setting above the village of Asseldrar. A cute pinnacle offering a warmup route at the Tramline slabs. Gee this rock does look familiar. 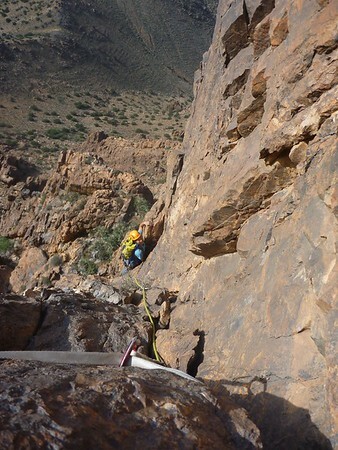 Road-side cragging with 2 minute access. 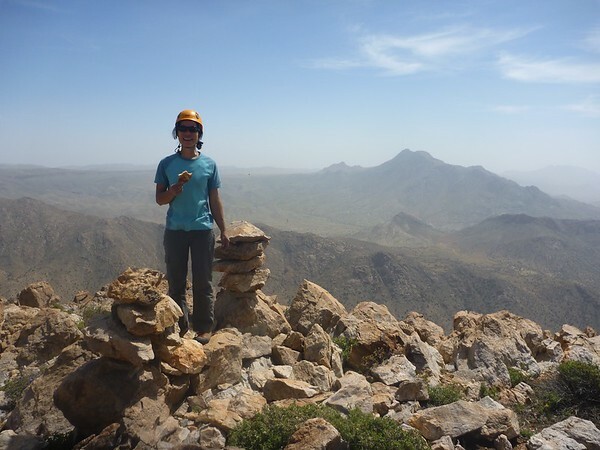 A bit of a ramble, but from the summit you can take in the endless undeveloped crags in the region. The rather intimidating first pitch of Lion King. Feeling ready for my summit pastry. We got into a routine of climbing a big route in the morning, and heading into the village of Idaougnidif in the afternoon to re-supply with pastries and provisions, where we also often met the other climbers in the valley (all six Brits) for afternoon coffee. Near the end of our trip we asked what was the best route in the area that we really had to do, before heading home. Have you been to Samazar? No we hadn’t - the guidebook said the road was terrible. You must go to Samazar - it’s paradise. So the next day we crawled our little Romanian-made hire-car up the rocky trails high into the mountains, and into the hidden valley of Samazar. What a Shangri-la! Lots and lots and lots of rock everywhere (hardly anything has been climbed, judging by the few entries in the guidebook for the valley) and pretty green villages dotted here and there. Perfect route, perfect rock, perfect summit. 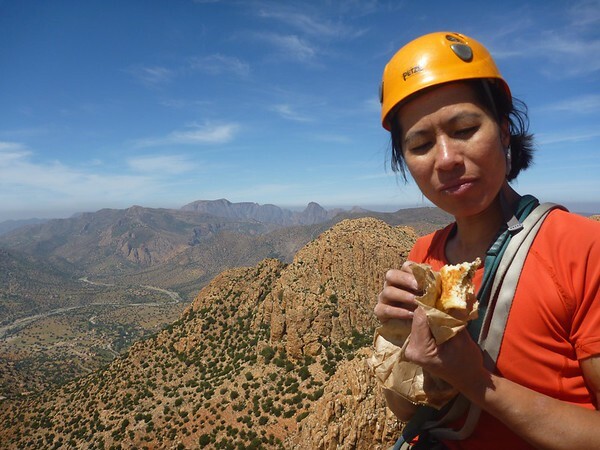 It was our last climb here, but the little taste of Samazar will ensure we will return. The rock is blue! What!? Why!? Well you’ll just have to come climb in the Anti-Atlas to find out yourself. Awesome TR. Thanks for taking the time to write it up. Really enjoyed your report. I particularly support your summit tradition of a Pain Au Chocolat! A great TR - yet another place to visit! Thanks so much for sharing that. can you comment further on the gear to take and what the rock quality was like? Brings back memories. You did a lot of the stuff Dave and I did in 2014.including White tower, lion King, pink lady, Tizgut, etc. 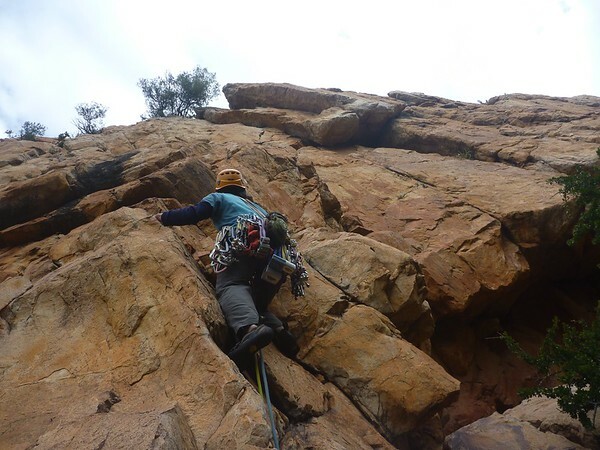 We put up about 6 new routes in Palm Tree Gorge, and quite a few elsewhere. We decided the author of the guidebook wasn't that good at Jambing, so the grades on cracks were quite soft. 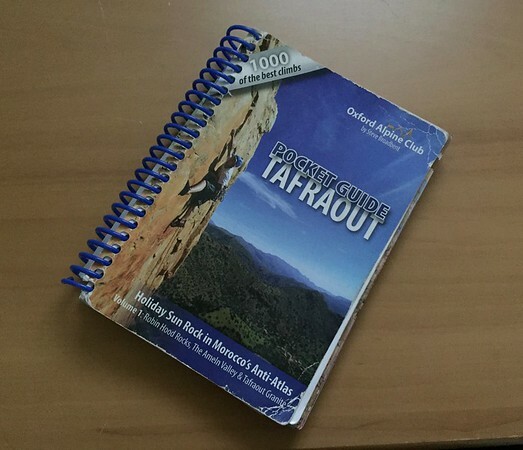 Of note there is competing guide books, and hundreds of new routes going in all the time. 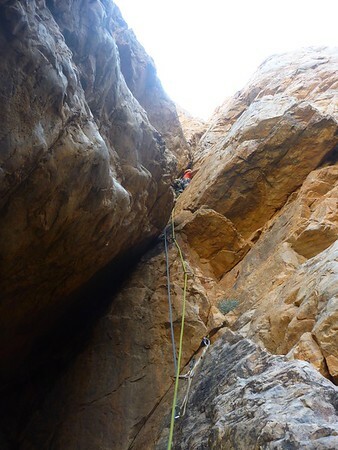 After 2 1/2 weeks in Tafrout and the Kasbah we went to Todra gorge. Taghia gorge is the other good place but we didn't get there. The rock quality is generally great, but varies from crag to crag with weathering. Some of the faces can be a bit flaky, and there is the risk of loose blocks like everywhere. Moonarie like in places. We used small cams and RPs quite a bit, in addition to a full double rack. Many 50 m pitches. 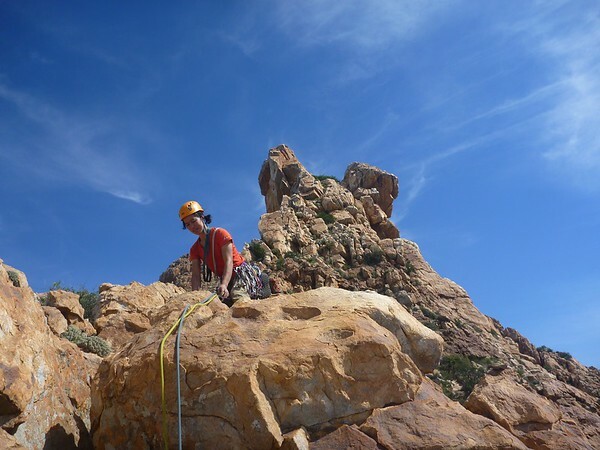 Highly recommended if you like trad climbing. Would be interested in where you stayed on the north side. The Kasbah was amazing, but rather pricey after our perfectly adequate digs in Tafrout for $12 per night. 11/10 - would read again! 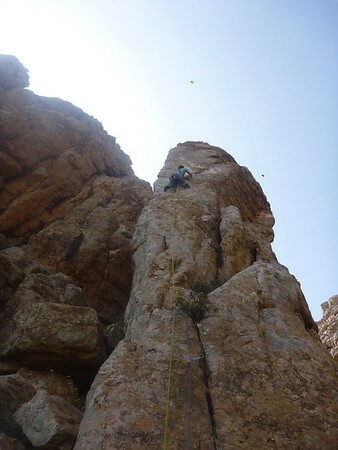 As vwills commented, the rock varies from crag to crag. It's a very big area. The Ameln Valley crags (Tizgut Gorge, Palm Tree Gorge et al) were ok but not perfect, but the higher crags like Robin Hood Rocks, were brilliant. 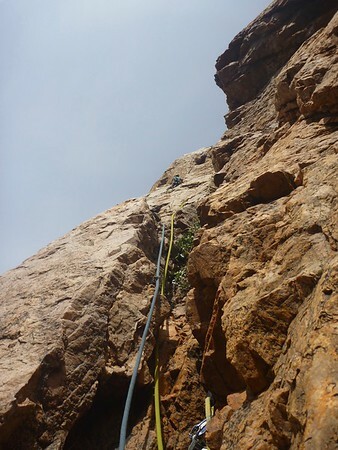 On the north side, again the higher crags of Asseldrar (Tramlines) and Idaougnidif region (Lion King et al) were excellent, but the lower road-side crag of Tizi Gzaouine were just ok. Moss was occasionally a problem on a couple of north-facing routes (Griffin Rock, Pink Lady). Overall the rock was excellent and I gather the north-side crags, which are further away from Tafraout but the current focus for new routers, is still turning up gems up there. 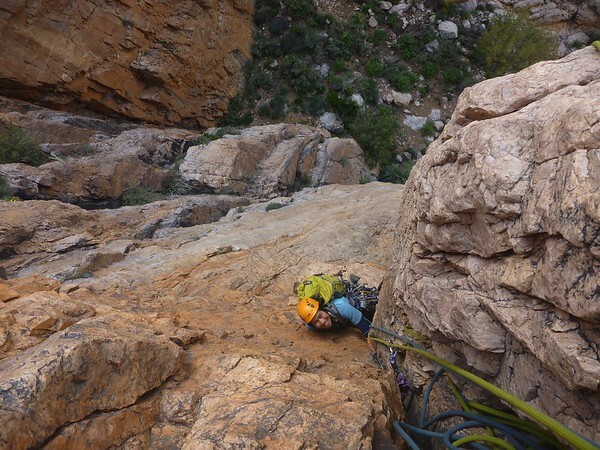 We took double ropes and a hefty full rack, paring it down depending on the route of the day. Most popular pieces were aliens, hexes and nuts. Cams of all sizes and RPs also got used. Least popular were the extra large cams (#5 and #6 friends). Although there are plenty of routes that need 'em, we simply didn't do those routes, and left them in the car most days. We did use them on Flake Quake though! 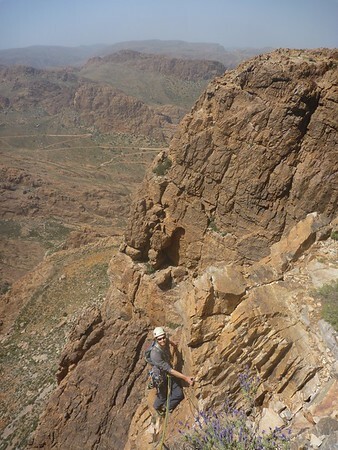 On the longer, easier routes we did plenty of simul-climbing, leading in blocks and unroped travel. Take lots of extendable draws and long slings, plus plenty of tat for beefing up rap slings. I would also highly recommend a pair of sticky-soled approach shoes, as most descents involved some exposed but easy down climbing. A climbing pack is necessary to pack a wind breaker and all those pastries. The March-April weather was generally perfect, with cold nights and warm sunny days. At the higher altitudes the breezes kept temps manageable in the full sun. Very dry Saharan air left me guzzling water a lot. You need long pants and a long-sleeved shirt for keeping the intense Moroccan sun from turning you into a sizzled kebab, also for dressing culturally appropriate when in villages and smaller towns. Ladies may occassionally wish to wear a head scarf, but its not mandatory. The five calls-to-prayer that carry across the valley are useful for calculating whether you're due for a benightment on that all-day mountain route. You can get by with just English, but French is very useful. It's worth learning a smattering of Arabic for greetings and ordering coffee and making friends. Locals were always keen to teach us words in the local Berber dialect, over endless cups of insanely sweet mint tea. 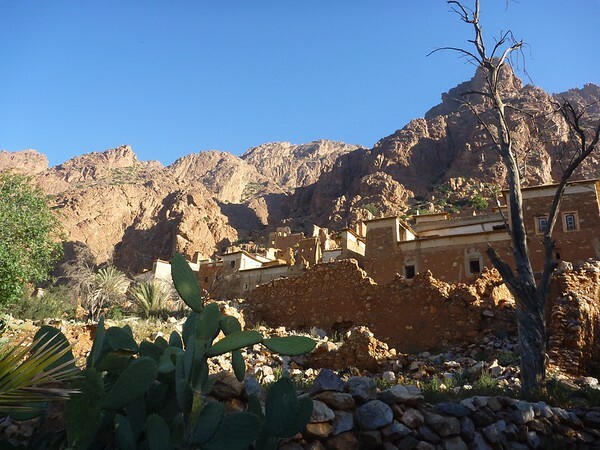 There is one place to stay in Madao, a small village on the road from the Kasbah about 10 minutes towards Tafraout. It's inside a local house but run by two Saharan guys who rent the property from a family that's moved to the city. Not as clean and well kept as the Kasbah, but cheaper, friendlier and the owners were relaxed and let us do our thing. I think it was 200 Dh for the two of us including meals, although we'd often skip the prepared breakfast as we wanted to get an early start. Meals were good. I understand you may be able to bargain down the Kasbah rate if you stay for a while and mention you're climbers. 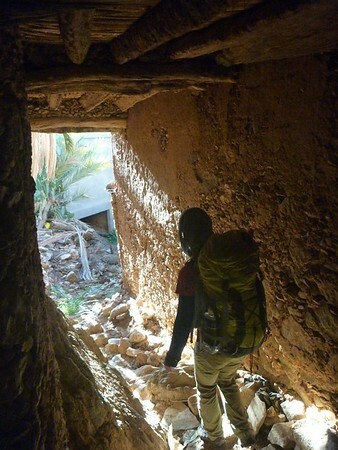 The climber's log in the Kasbah had a note from two Brits who'd managed to find accomodation up in the Samazar valley. They said you'd need French or Arabic to ask around to find it. That would be a great base and save the epic drive up the hill every day.